England striker Wayne Rooney will miss the Euro 2012 group stage after being handed a three-match ban by Uefa over his sending off against Montenegro on Friday. Former England manager Graham Taylor told BBC Sport how Rooney's ban affects England's hopes in Poland and Ukraine next summer. How will Fabio Capello feel about being without his best player? "It will be hugely frustrating for Capello, particularly because the situation was entirely preventable. 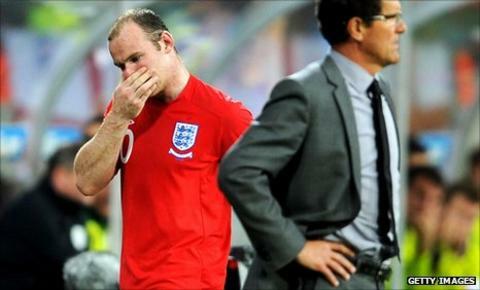 It is tremendously disappointing for England and it is not going to help their cause at Euro 2012 in any way. "Of course, between now and then, Rooney could have got an injury but, for an international manager heading into a major tournament, that would have been easier to accept. "This is something that should not have happened. Rooney's behaviour has improved recently but he still has a tendency to react in the way he did when things are not going well for him. He has tried to change his ways but that is part of his make-up." Were you shocked by the severity of Uefa's punishment? "I can't say I was surprised. The problem Rooney had was that, irrespective of his letter and the FA's support, he deliberately kicked that person. Whether it was a soft kick or a hard kick doesn't come into it. "Some people will complain and say Uefa have got something against England but, if you deliberately kick out at someone, whether you hurt them or not then you are running the risk of the three-game ban that he has got." Would you still take Rooney to Poland and Ukraine? "I would definitely take him because he is our outstanding player. I can imagine that, if we get through those first three group games, to be able to bring him back into the side will be a massive lift for the team. "And, if we are actually saying we totally rely on one player to get us through the group stage, then we may as well not go. "Great player that Rooney is, if we are a team that totally relies on one player, then we are not going to win anything anyhow." Is it the end of England's hopes at Euro 2012? "No. I in no way get as down about this as other people think we should, because I have seen these things happen so often before. "A player becomes unavailable and people think 'that's terrible, that's cost us our chance' but suddenly someone else comes in and the team functions just as well, if not better." How do we prepare for life without Rooney? "Capello will do what he was going to do anyway, which is try different combinations up front, and other players will have to stake their claim. "I know it sounds crazy but Capello has just got to assume that Rooney is injured for three games and he has to try somebody else. I know he's not, but it could have happened. "As an international manager, you always think about 'what if', but you don't necessarily have a contingency plan to replace your best player, not from a sending off anyhow. "But at least Capello has time to decide what to do now. "We have friendlies against Spain and Sweden coming up next month. He has got those two games for starters and we will have got to get used to an England team playing without Wayne Rooney so we are ready go into those first three games of the finals. "It will be interesting to see what Capello comes up with." "Danny Welbeck has looked very promising when he has come on and I think he will get a chance to play a full 90 minutes somewhere. "We already know that Darren Bent basically needs the ball in the penalty box to score goals. He is not the best at holding it up and linking play but when the ball is in the box he comes alive. "Capello will have his ideas what he wants to do, whether it is someone else playing behind his main striker as Rooney did, to introduce an out-and-out striker partner - or something else. "And there is no doubt about it, since Rooney was sent off he will have been thinking about it quite a lot."